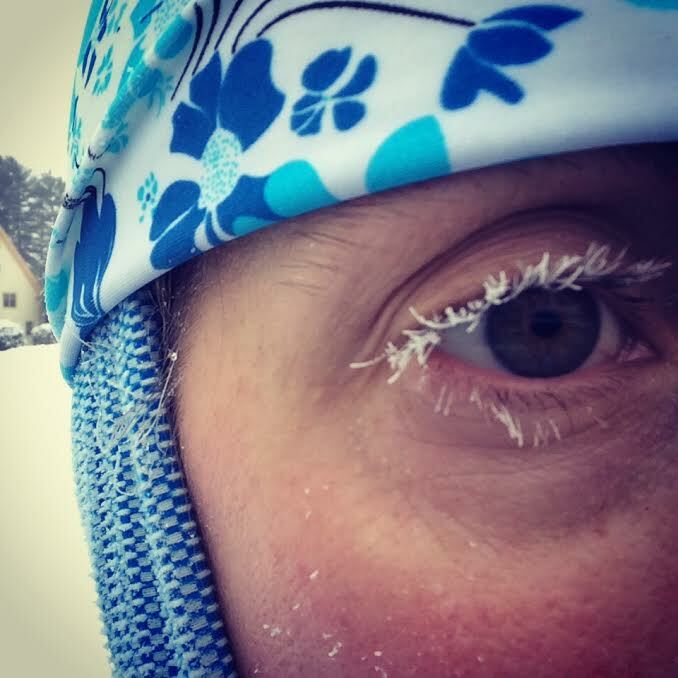 Running in the "Polar Vortex"
It’s so cold my eyelashes froze on my run! Apparently we are in the middle of a “Polar Vortex Distortion” which is causing severely low temperatures throughout much of the United States. 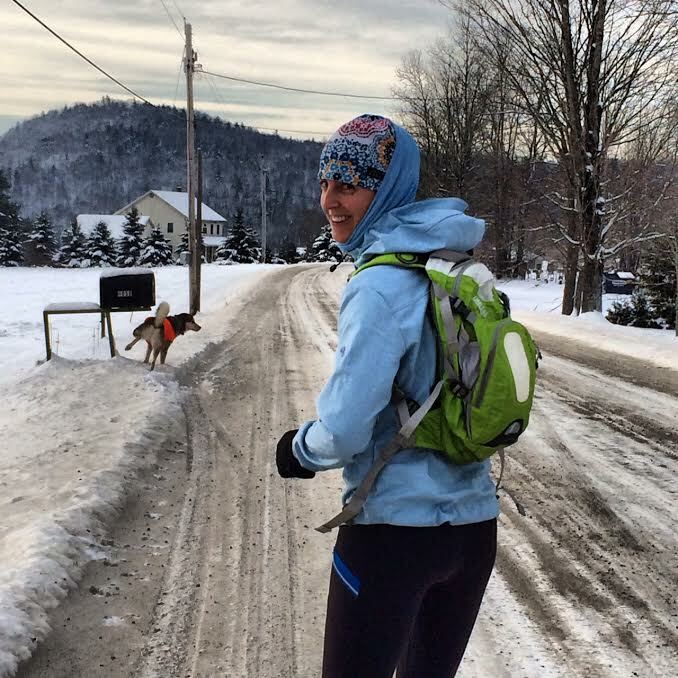 Living in New Hampshire we often experience uncomfortable cold during the middle of winter so I have become accustomed to adjusting my training and workout apparel based on the weather in order to still get in the miles and staying warm. You just need the right gear. Perhaps its best to stay inside! Ok, so perhaps I’m not a poet but I do have some winter running tips to help you through the arctic freeze that has hit the nation. Roll over and go back to bed. If it’s just too damn cold, snuggling under your warm covers is the best option. Ok, so maybe you need to get those miles in . . . if its just too cold to go outside find a treadmill or an alternative workout that will keep you moving and warm inside–perhaps it’s time to try some Yoga, Spinning, or Insanity. If you are braving the Vortex it’s time to don your vortex gear which means dressing like you are headed out for a polar expedition. Layer! Layer! Layer! Choose layers that are made of technical fabrics that will wick moisture away from your body to help keep your core temperature up. Plus if you are like me, even when you feel as cold as a penguin you will still be as sweaty as if you were running in the middle of summer. It’s actually very important to stay hydrated when you run in the cold. You can quickly become dehydrated in the cold and also your circulation won’t be as good if you are not properly hydrated. Before you head out for your run fill your hydration pack with warm water before your long training run. Don’t forget to blow warm air into the tubing to push the water back into your hydration bladder so that the tubing doesn’t freeze five minutes into your run leaving you thirsty. EAT! Make sure you carry proper fuel with you on your run because you will burn calories faster when it is cold. If you do not stay properly fueled you will have a much harder time staying warm and its hard running when your tummy is “rumbling” from hunger. Don’t forget to cover your head with a cozy hat! Even though you may end up with crazy hat hair after your run, wearing a hat will keep you from losing body heat from your head during your run. Find a friend who is just as crazy as you to join you on your expedition into the vortex. Just because you feel like Princess Elsa in Disney’s Frozen, that doesn’t mean you can’t have a little bit of fun! I hope these tips help you to enjoy your polar vortex run a little bit more but just remember to stay safe and don’t go out if the temperatures are dangerously low. Happy running and stay warm! OMGOSH ARE THOSE REALLY YER LASHES?! I shall never whine about being cold again. MIZ recently posted…Gluten-free egg in a frame. Yes 🙂 Definitely not white mascara! The weather has been frigid to say the least but since I am training fro Boston I’ve got to get out as much as I can even if it means going when the weather is white wild and freezing! Thanks for stopping by Carla! Your lashes are pretty that way but yes, freakishly cold! Be safe! You had me at tip #1. But then I was not going to run anyway. Nor do I live in snow. Oops. The dog photobomb is the best!! I’m a big fan of tip #2. I only run outside in ideal weather conditions, otherwise it’s all treadmill all the time.